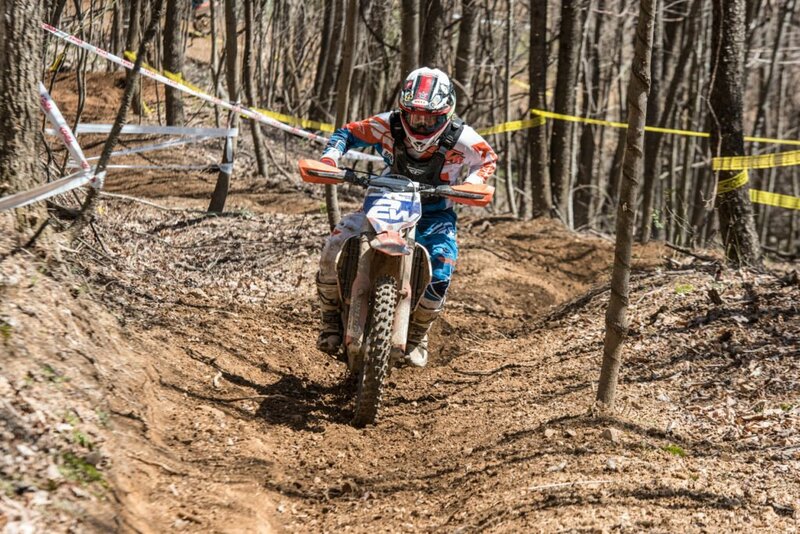 Bristol, Virginia (April 1-2) – Ryan Sipes claimed his second victory of the season at round three of the Kenda Full Gas Sprint Enduro Series presented by PRI Powersports Insurance, putting his Coastal Racing Husqvarna on top of the box ahead of SRT KTM Racing’s Cory Buttrick and Beta USA’s Jordan Ashburn. A slippery track greeted the riders on Saturday morning as heavy rains and strong winds the day before left the Bristol area drenched. 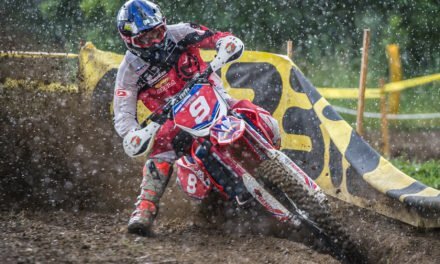 However, the conditions quickly improved as the sun began to dry the track and the racing was fast and close all weekend on what some of the riders considered the best dirt the series has seen all year. 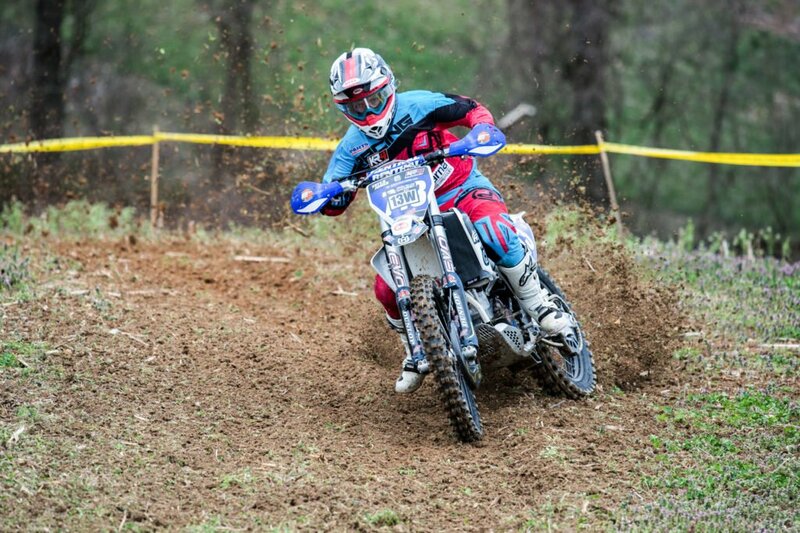 Unlike the previous two rounds, which were located at motocross facilities, the Virginia race was held at a more traditional venue, with a true “grass track” Cross test and an Enduro test complete with tight single-track, a few fire roads, a technical blast through a shallow creek and even a rocky section. In all, Sipes claimed eight of the 12 test wins on the weekend – five on Saturday (three Cross tests and two Enduro tests) and all three Enduro tests on Sunday. 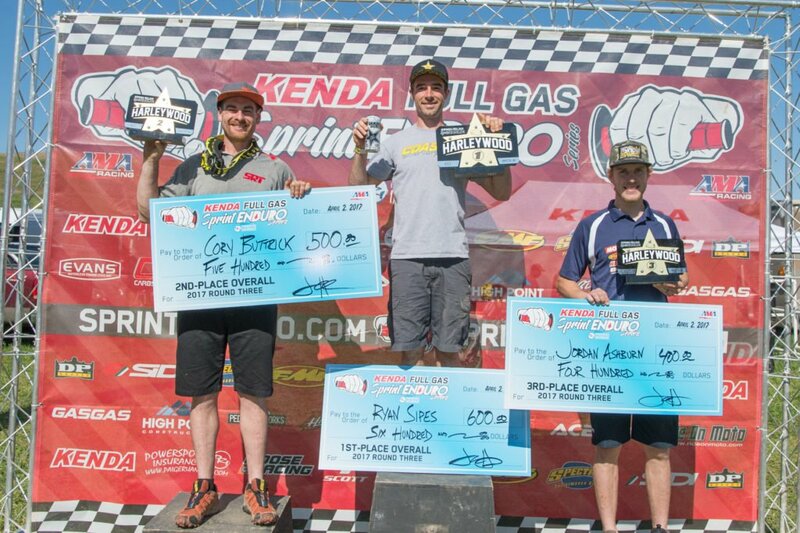 SRT Racing’s Steward Baylor, Beta USA’s Jordan Ashburn and Am Pro Yamaha’s Josh Toth split the remaining four tests among themselves, which played right into Sipes’ hands, allowing the Kentucky rider to extend his lead in the final results. Buttrick turned in his best race of the season with a runner-up finish. The Ohio rider failed to win a test outright, but was consistent all weekend, logging four seconds and three thirds in the 12 tests. Buttrick won round six of last year’s series and was in position to capitalize in Virginia if Sipes faltered. Ashburn is now three for three for third place finishes after grabbing the final step of the podium behind Sipes and Buttrick. 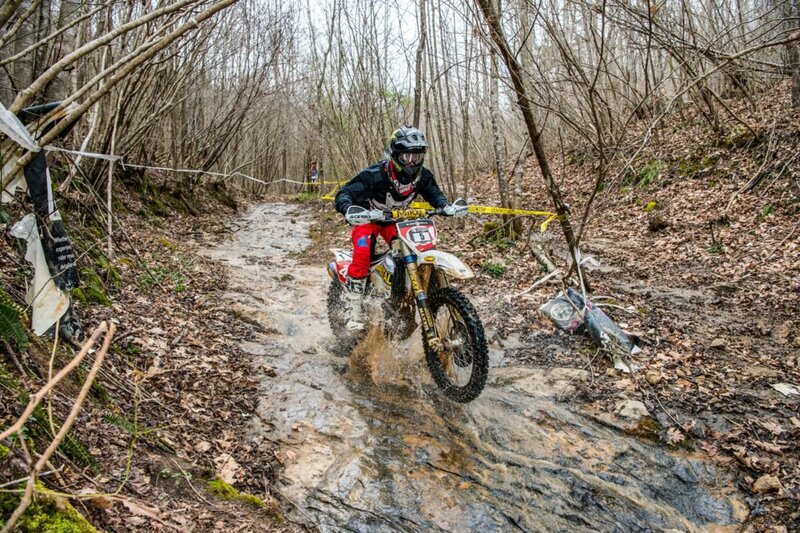 The Tennessee rider won an Enduro tests on Sunday and spent most of the weekend battling with Buttrick and Baylor. Baylor’s weekend went from bad to worse when a crash in the first test on Saturday aggravated an old shoulder injury and left the South Carolina rider battling the pain as well as the competition. In one crash, Baylor crushed his throttle tube leaving the throttle stuck wide open and he had to finish the test with the clutch to slow him down, which cost him about 20 seconds. Despite the problems, Baylor still won two tests and maintains second in the series standings. Josh Toth turned in an impressive weekend to finish fifth overall. 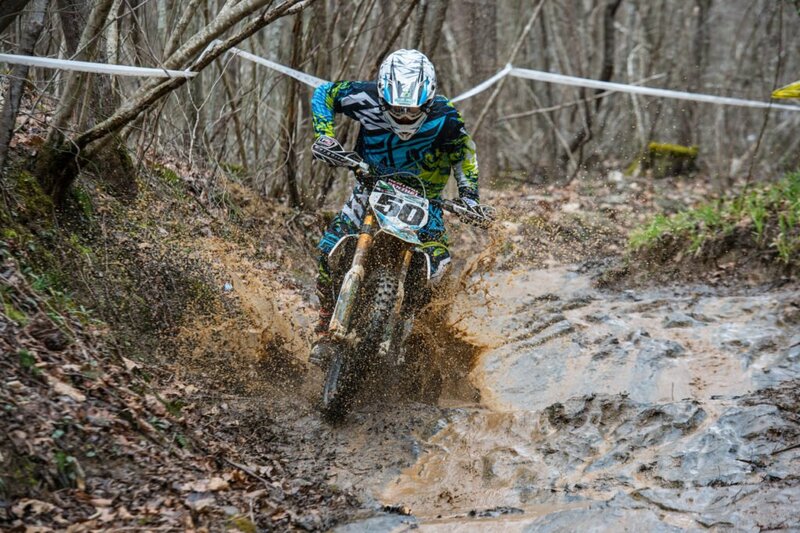 The Am Pro Yamaha rider won the final Enduro test on Sunday and finished second in one of Saturday’s Enduro tests. KR4 Arrive-n-Ride Husqvarna’s Jesper Borjesson found the grass track to his liking and turned in some fantastic times – especially on Saturday. 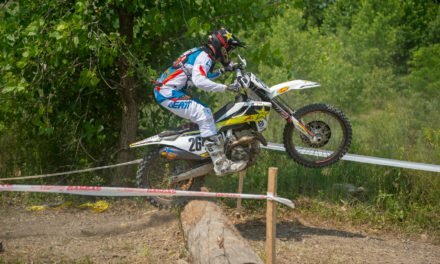 The ISDE rider from Sweden is also starting to get the hang of the tighter Enduro tests and actually tied Ryan Sipes for the fastest time in the final Enduro test of the day on Saturday. Borjesson switched from a 250 to a 350 for the Virginia race and credited part of his success to the change in bikes. 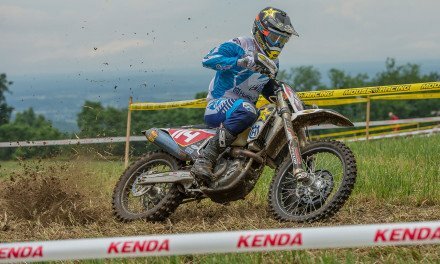 Sherco Off-road’s Evan Smith turned in his best performance of the season with a seventh place finish. Smith consistently finish sixth and seventh in the tests all weekend with the exception of a third place finish in the first Enduro test on Saturday. 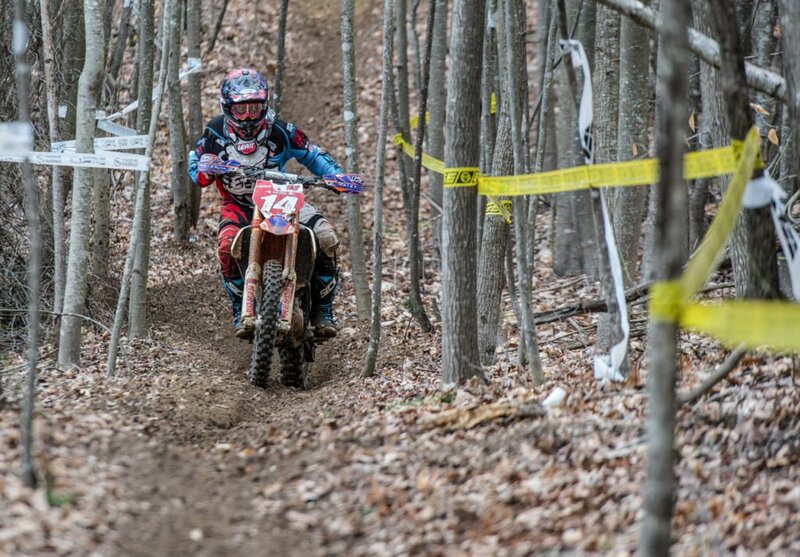 KTM riders Hunter Neuwirth and Clayton Gerstner rounded out the top nine in the Pro division. After three rounds, Sipes leads the series standings with 115 points, followed by Baylor with 105 and Ashburn with 76. 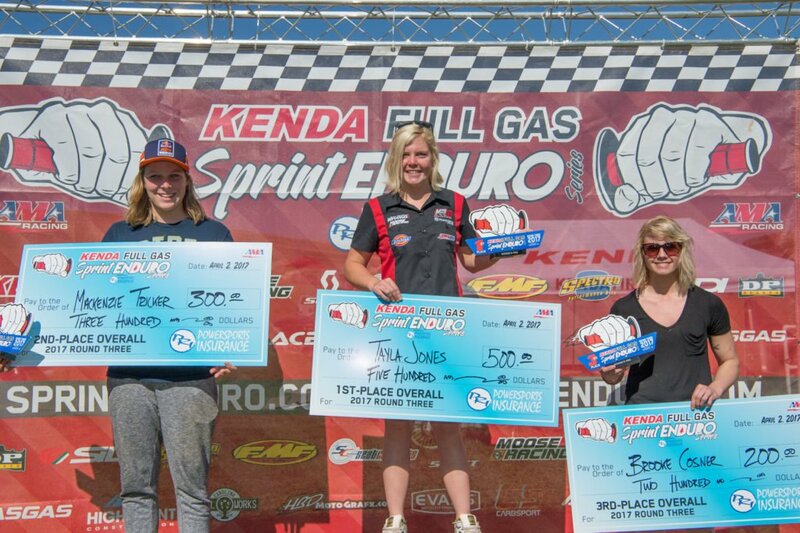 KR4 Arrive-n-Ride Husqvarna Tayla Jones of Australia claimed her second win of the series in the Women’s Pro division, ahead of Bonanza Plumbing KTM’s Mackenzie Tricker and Maryland’s Brooke Cosner. Jones won all 12 of the tests and beat out Tricker by three-minutes-and-15-seconds. Jones even finished as high as ninth overall in one of the Cross tests. 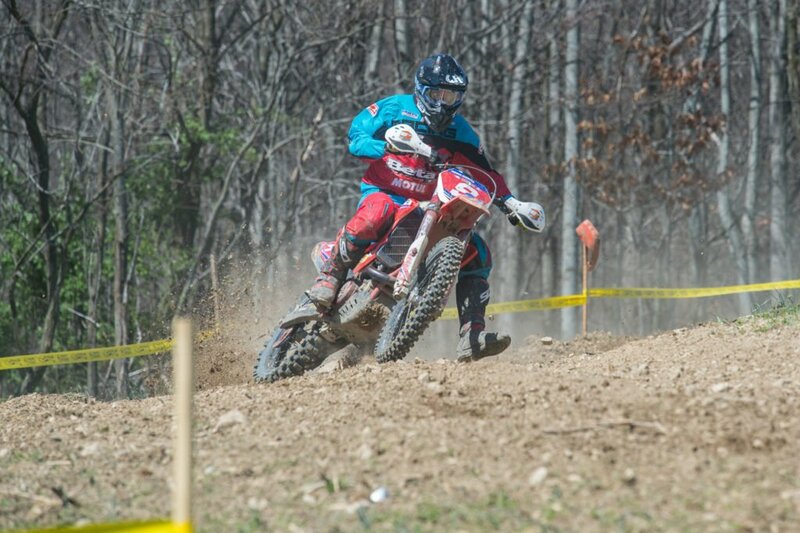 Billy Schlag took top Amateur honors and first in the Open A division with an 8th overall finish. 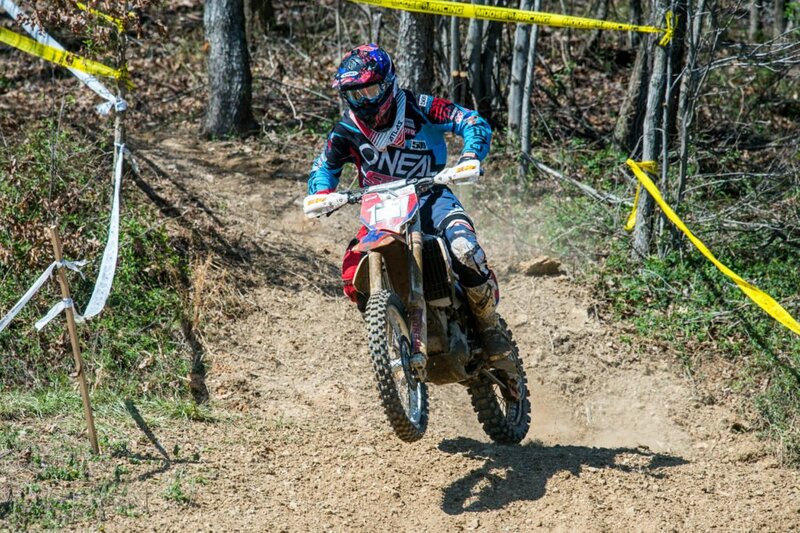 Meanwhile Jacob Rowland was second Amateur and second in Open A class with a ninthth overall finish. Cody Pingley of West Virginia rounded out the top three Amateurs in 10th overall and finished third in the Open A division. Cole Mattison of Inman, South Carolina topped the Lites A division with an 11th overall finish. 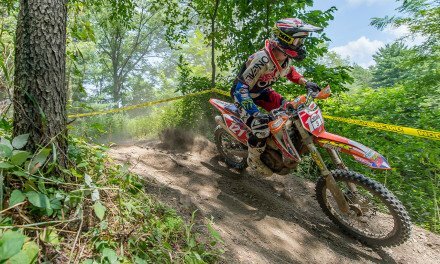 The Kenda Full Gas Sprint Enduro Series presented by PRI Powersports Insurance resumes action on May 12-14 in Greeneville, Tennessee for round four of the series, which also doubles as a three-day AMA ISDE Qualifier. For more information on the Tennessee race or information on the Kenda Full Gas Sprint Enduro Series presented by PRI Powersports Insurance go to www.sprintenduro.com.